Ah It’s good to be alive! With upbeat background music tracks like these, it’s easy to have a positive outlook and get the most out of life. Give your projects a lift and download ‘Upbeat Background Music V1’ today to put the finishing touch on your uplifting sound track. For ‘Upbeat Background Music V1’ we wanted a slightly uptempo, funky feel with a real element of fun mixed in. With track that feature horns, acoustic guitars and plenty of synthesizer and electronic elements, we’ve managed to keep things upbeat and motivational. These 6 fun and chirpy instrumental tracks give the perfect vibe to suite project topics like surfing, skating, dancing, action and pretty much anything you can think of that needs that upbeat groove. Have a listen to the previews and you’ll hear the fun and funky mood selection put together for you. These 6 upbeat background music tracks feature instrumental music that you can just drop right into your latest project for the ideal musical score. ‘Upbeat Background Music V1’ brings the fun in a modern, contemporary style that fits with a wide range of audio/visual projects. As with all of our Music Packs you’ll become licensed for royalty free usage as soon as you complete your purchase. 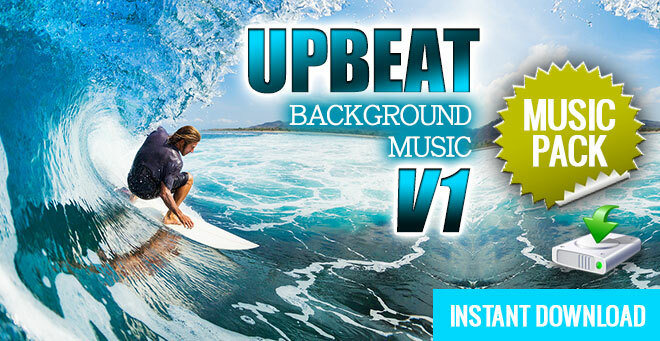 Download ‘Upbeat Background Music V1’ for your latest projects and start off on the right foot.